Corrugated fiberboard construction. 2.75" square tube openings are reinforced with plastic molding to prevent tears and snags. Organizes up to 20 rolls at desk side. Assembles quickly & easily. Color: Walnut wood grain finish. 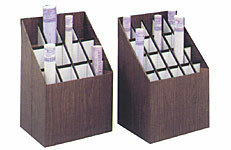 3079 - Has tube size of 3 7/8" x 3 5/8" with 12 compartments. 3081 - Has tube size of 2/34" with 20 compartments. SAFCO UPRIGHT 12 TU RL FILE 12"
SAFCO UPRIGHT 20TU RL FILE 12"